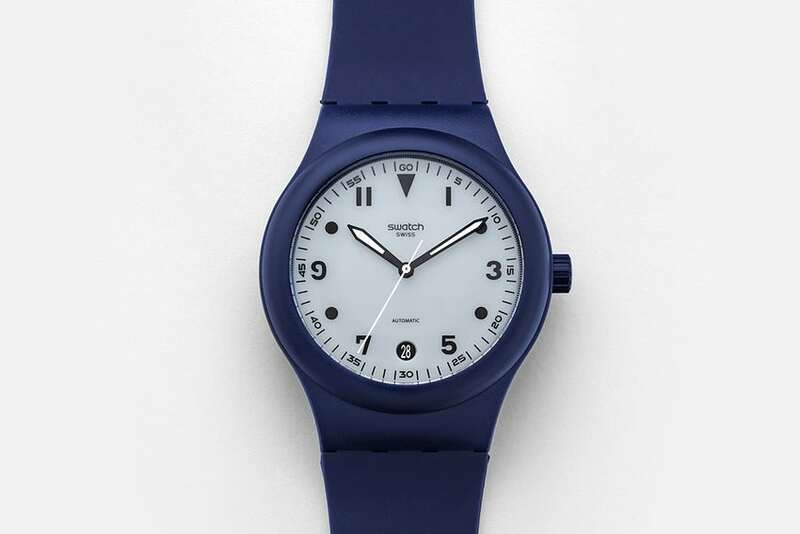 Swatch made a name for itself in the 1980s as the Swiss plastic quartz watch that would battle against the Japanese quartz watches that were taking over the industry. Conversely, ten-year-old HODINKEE shot to prominence as the go-to online resource for all things luxury mechanical watches. While these two brands focus on entirely different and rarely overlapping sectors of the watch industry, this is, in fact, the second time they’ve come together to release a special edition watch. Let’s find out more about the brand new Swatch SISTEM51 Blue Edition For HODINKEE announced today. When the first Swatch launched in 1983, the watch was revolutionary in that it was only comprised of 51 parts and its assembly was fully automated. This streamlined production allowed Swatch to manufacture massive quantities of the Swiss quartz watch to reach millions of customers around the world. Three decades later, Swatch took the same approach but this time applied it to an automatic mechanical movement. In 2013, Swatch announced the SISTEM51 watch powered by the world’s first mechanical movement made entirely by a fully automated process and constructed from only 51 parts. Boasting a unique oscillating weight structure, an accuracy rating of -/+ 10 seconds per day, and a power reserve of 90 hours, this Swiss-made automatic watch can be had for a mere $150. With SISTEM51, Swatch shook things up (yet again) by making a Swiss mechanical watch accessible to a much wider audience. For the price, it is not considered to be a part of the other luxury watches despite its widespread fans. In 2017, HODINKEE and Swatch joined forces to release the SISTEM51 HODINKEE Vintage 84, inspired by a 1984 Swatch design but equipped with the revolutionary SISTEM51 automatic movement. With a price tag of $150, the SISTEM51 HODINKEE Vintage 84 sold out online in less than 72 hours. This isn’t the first time HODINKEE had a collaboration with a brand, their first partnership was just as much of a success if not more. Just in time for the busy holiday shopping season, a new Swatch SISTEM51 Blue Edition For HODINKEE was announced today. Instead of black, this time the collaboration went for a more vibrant look reminiscent of the colorful Swatch watches from the 1980s and 1990s. The 42 mm case is made from translucent blue plastic and is fitted with a blue silicone rubber strap. The gray-blue dial has HODINKEE influences all over it from the hand-drawn numerals inspired by 1940’s watches and the eclectic mix of odd numbers and dots to the broad luminous center hands and discreet date window at 6 o’clock. Turn the SISTEM51 Blue Edition For HODINKEE around and you’ll spot the SISTEM51 movement dressed in swirling red, white, and blue shades through the transparent caseback. 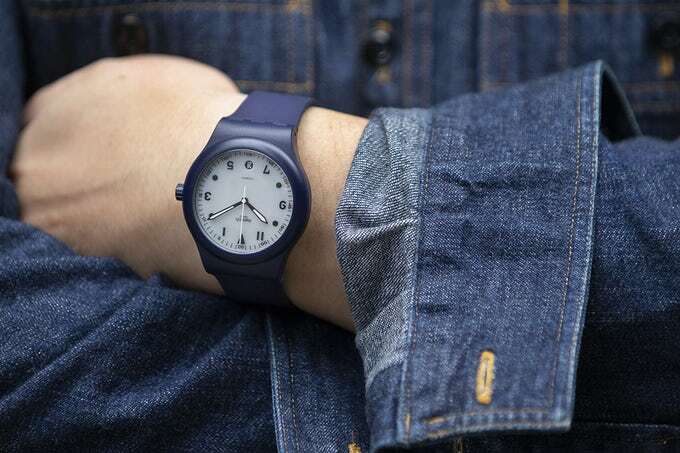 Just like the previous collaboration, the Swatch SISTEM51 Blue Edition For HODINKEE watch is priced at $150 it is currently available in the online HODINKEE Shop and on the Swatch website. 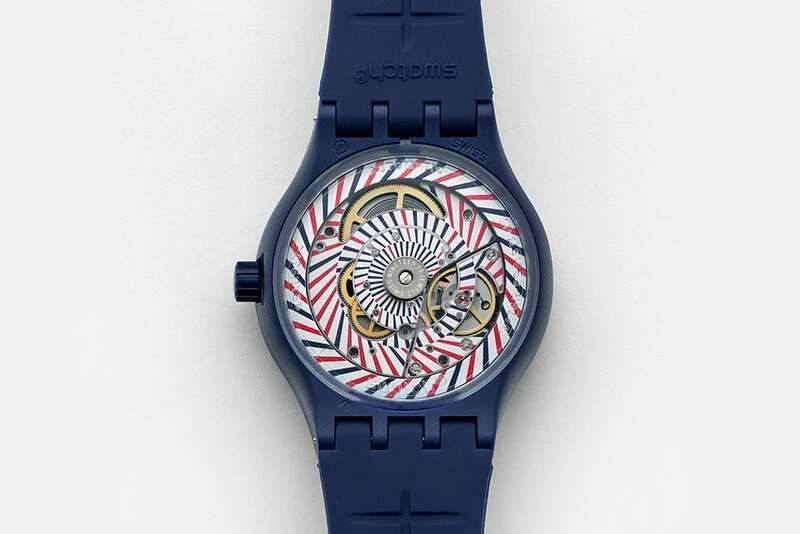 It will also be sold in limited quantities at the Swatch Times Square flagship boutique in NYC from November 29. If you’re interested in buying the SISTEM51 Blue Edition For HODINKEE, don’t wait too long to pull the trigger as we’re certain this version will sell out fast as the first one did.